This trek to Triund is a 2-day adventure trail that gives you a chance to escape into the mountains, walk through an overgrown forest and stay in a mountain lodge at Triund. En route, you'll pass through breathtaking vistas of Himachal's mountains and make your way across rich forests of oak, rhododendron and deodar. From the alpine meadows of Triund, you’ll grab amazing views the Dhauladhar mountains and the Kangra valley. 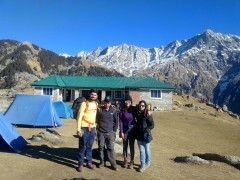 A popular overnight trek for most travellers to Dharamshala or McLeodganj, the Triund trek takes you on a relatively easy route, perfect for amateur as well as experienced trekkers. NOTE: Price displayed is calculated on the basis of 4 to 6 travellers. Triund, at an elevation of over 6,800 feet, is a hill placed at the foot of the Dhauladhar mountain ranges. 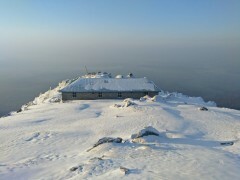 The top of the hill serves as a great vantage point to view the taller, snow-capped mountains of the Indian Himalayas. A popular destination for travellers looking for a quick and easy adventure in the mountains, Triund also attracts more experienced trekkers who continue onwards to the Indrahar Pass. During this trek, you’ll stay at a mountain lodge built at the top of Triund, allowing you to complete the trek and stay indoors in the night. The lodge is equipped with comfortable beds and common washroom facilities. • Trek to Triund to explore rich Himachali landscapes. • Trek for hours in the day and stay indoors at night. • Catch gorgeous views of the Dhauladhar mountains and Kangra valley. • Embark on a short and easy trek in Himachal Pradesh. Travellers are required to follow instructions of the trek leader during the trek to Triund. 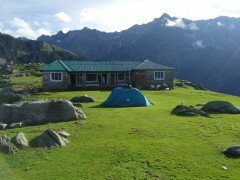 For cancellation made on or more than 8 days before departure of the Triund trek: 75% refund. For cancellation made less than 8 days before departure of the Triund trek: no refund. The trek to Triund begins at 08:30 hrs on day 1 at Bhagsu Nag. 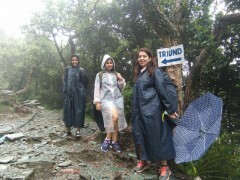 During the trek to Triund, weather can drop to low temperatures. Travellers are recommended to carry adequate warm clothing. 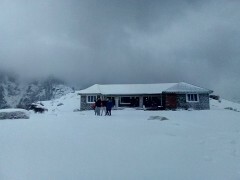 The tour operator reserves the right to cancel or alter the itinerary of the trek to Triund to ensure maximum safety for travellers as well as staff. There is no pick-up for this Triund trek. There is no drop-off for this Triund trek. Arrive at the tour operator's office by 08:30 hrs today. From here, you'll begin the trek to Triund. You'll start off with a steep trail passing through thick and overgrown forests of oak, rhododendron and deodar. After 5 hours of trekking, you'll stop to have a packed lunch and resume trekking again until you arrive at the alpine meadows of Triund. 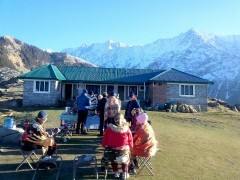 Celebrate spectacular views of the Dhauladhar mountains and the Kangra valley with some hot tea and snacks. Overnight in a lodge at Triund. Wake up to misty, mountain views and make your way back to Bhagsu Nag. However, depending on weather conditions and logistical concerns, you may take a different route that goes through the Laheta village and past the Bhagsu Waterfall. 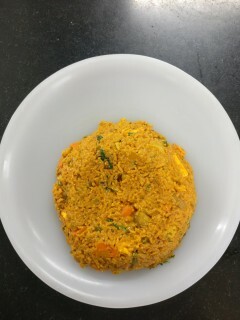 Reach Bhagsu Nag by 13:00 hrs. Your trip ends here. 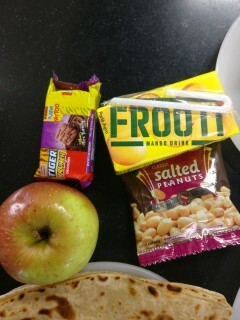 Overnight in a lodge at Triund. 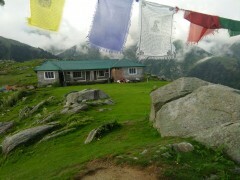 Arrive at the tour operator's office in Bhagsu Nag by 08:30 hrs and trek to Triund. 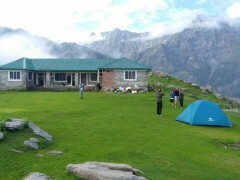 You'll be accommodated at Triund in twin/triple-sharing mountain lodge. The lodge will have a common washroom facility. 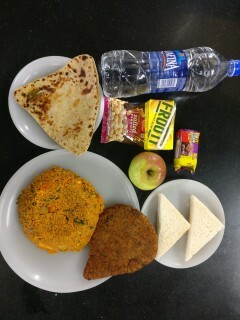 Today's meal package includes packed lunch, evening snacks and dinner. Have freshly cooked meals at the mountain lodge. Begin trekking downhill to Bhagsu Nag. 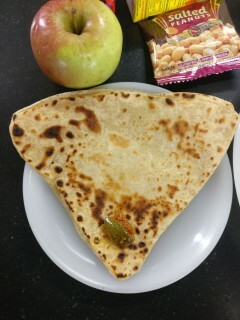 Today's meal package includes breakfast only. Light refreshments will be served before reaching Bhagsu Nag. 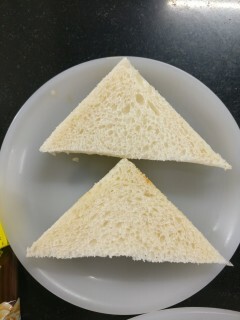 Sandwich, part of the packed lunch. Summit Adventures, Main Square, Bhagsu Nag, Dharamshala.